The 15th match of the Indian Premier League - IPL 2019 will be played between Mumbai Indians and Chennai Super Kings on 3 April 2019 at Wankhede Stadium, Mumbai. As far as weather is concerned, the temperature will be below 30°C but humidity will be in high 70, so dew can be seen later in the match. Wankhede has a batting-friendly pitch. The ball will come on to the bat nicely, should be plenty of runs on this surface, a typical Wankhede pitch. Spinners will be more useful here than the pacers, both teams might play with two full-time spinners. Mumbai Indians are still struggling to find their momentum; only won one match of the three matches played this season. On the other hand, Chennai Super Kings are the only undefeated side in the IPL 2019; winning all three matches till now. In Mumbai Indians camp there can be multiple changes; there are chances that Mitchell McClenaghan and Kieron Pollard might be sent to the bench bringing Jason Behrendorff and Ben Cutting in the respective places. For the Chennai Super Kings, a full-time pacer will be needed looking at the conditions; Mohit Sharma may be replacing Mitchell Santner for some extra strength to the bowling unit. Mumbai Indians and Chennai Super Kings have played altogether 24 matches against each other in Indian Premier League (IPL); out of which 11 matches are won by Chennai Super Kings and 13 are won by Mumbai Indians. Mumbai Indians (MI) and Chennai Super Kings (CSK) have met twice in IPL Final and both have won once. 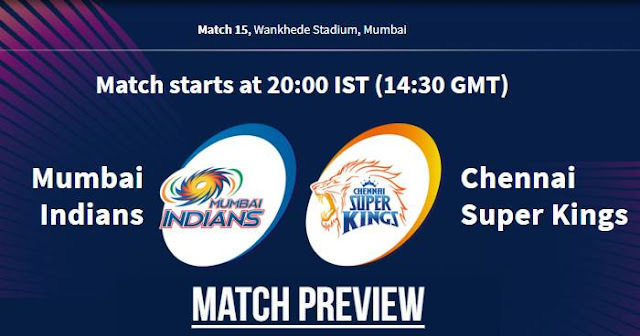 At Wankhede Stadium, Mumbai Indians and Chennai Super Kings have played 8 matches against each other with Mumbai Indians winning 5 matches and Chennai Super Kings winning 3 matches.